I've been hearing about Dave Ramsay's The Total Money Makeover since I first started reading blogs. It seems like every US blogger I follow is a fan of Dave Ramsay. I've been wanting to read one of his books for the longest time, but they weren't available in any Wellington libraries. 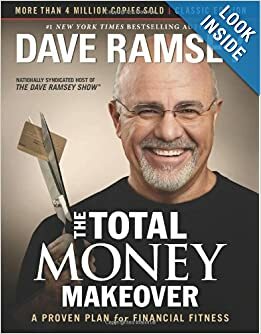 I was super excited when I searched for Dave Ramsay in the Auckland library system last month and found several copies of the The Total Money Makeover. I guess there are advantages to living in the Big Smoke. I reserved a copy, and excitedly jumped straight into it after it arrived. I was hoping to lend The Total Money Makeover to Paul after I had finished with it, so we could get on the same page financially, but after getting about 140 pages into it and still having read nothing really useful for our situation, I flagged that idea. Instead I just talked about it with Paul, summarising the points I found useful, pretty much like I'm going to do for you here. Dave Ramsay made a lot of money in real estate in his twenties, and then went bankrupt and had to build his way back up from nothing. He's learned a lot about finances along the way, and now has a very popular financial talkback radio show in the United States. He's also got a whole lot of other strings to his bow: more books, financial prorgammes, budgeting software and so on. Dave seems to have written The Total Money Makeover for a certain type of reader; someone who has gotten themselves into a lot of debt - we're talking consumer debt on the credit card, hire purchases, car loan, student loan and house-mortgage-type-debt. The way he talked about it in The Total Money Makeover, it seems the standard American practice is to ring everything up on credit instead of paying for it with cash. Surely that can't be true. Can it? Anyway, because that was Dave's base assumption for The Total Money Makeover readers, he spent the vast majority of the book explaining why debt is a bad thing, in all its forms, and how to get out of it. I read through it all, but found it really just confirmed what I already thought about debt, which is to avoid it like the plague. Something he did say about debt that interested me was to 'never a lender or borrower be'. Dave said it will destroy relationships. Either give the money outright, or don't give it at all. That includes being a guarantor on a bank loan. He said he has talked to so many people on his radio show who've had relationships end over the simple lending or borrowing of money. Good to know. The really useful thing about The Total Money Makeover is Dave's list of seven baby steps to get yourself on the path to financial freedom. You may find it interesting that he recommends putting money into retirement before a house. I did. His reason was that he's met too many retired folk who own their house outright, but have no money to live on and find they have to sell their house to fund their lives. Reading this book I realised that we are not putting anywhere near 15% into our retirement funds. I don't even thing that would be possible for us right now, but this is the step I really want to put my energy into. I would have loved some advice from Dave on how to do this. He seemed to assume that once people had paid off all their debts, they would have so much disposable income from what they used to be paying as interest, that they would automatically be able to put 15% into a retirement fund. Well, we have no debt, but we also don't have an extra 15% of our income sitting around doing nothing. It's all accounted for in the day-to-day bills, so I'm trying to find creative ways to squeeze more out of our budget so we can better fund our retirement. I also would have liked Dave to go into more detail on ways to pay off your home mortgage. He mentioned the idea of paying 100% down for your home, but didn't expand on this at all. He also didn't give any real advice on the last baby step - how to build wealth. In reality, a lot of The Total Money Makeover just seemed like an advertisement for The Total Money Makeover. Dave went on and on about how it was a proven plan. I felt like there were pages of wasted words that could have been better spent expanding on the latter baby steps that he barely touched on. There were lots of lovely case studies of readers who had followed The Total Money Makeover and gotten themselves out of debt, but, like the rest of the book, their stories seemed to finish there. I really wanted to know what these people did next. Still, maybe I wasn't his target audience. Maybe the people he was writing for really needed reassurance that his plan would work for them. He's obviously a successful advisor who has helped a lot of people sort out their finances. Who am I to argue with his writing style? What are your Total Money Makeover tips? That's good advise Lizzie. It definitely has helped me sharpen up my spending, so that's got to be good. I'm more conscious of how much money we have and where it goes. And it's got me more forward focused, in terms of retirement. I'm glad it helped you after Stuart's accident.